The notion of sleeping gas may conjure images of smoky, dream-like images and there is good reason for the unreal picture. While the gassy sleep agent may seem like a possibility, it is actually a product of science fiction. The myth of a gaseous substance that served as a way to put someone to sleep is one that has been quite popular in fiction, including movies and books. Science fiction, fantasy and futuristic writings often use the element in their tales. Stories present the mythical gas in a number of ways. The Nation Master Encyclopedia offers a wonderful definition of sleeping gas that suggests that fictional pieces weave the subject into their schemes. Characters in these stories may use the gaseous substance to subdue large numbers of people or they can use it to put one or two characters off to sleep. The element is a favorite among espionage and spy, as well as any number of adventurous tales. Sleeping gas in its fictional presentations is an orenogenic gaseous substance. Oneirogens are quite real and include non prescription sleep aids. In its fictional presentation, sleeping gas puts its subjects into the delta state, in which delta brain waves are present. This is a very deep unconscious state that occurs during the third and fourth stages of sleep. Some may readily confuse nitrous oxide with sleeping gas. However, nitrous is a relatively outdated anesthetic that was initially used for entertainment and later for its painkilling qualitative. Nitrous oxide goes by laughing gas as well, in spite of the fact that laughter is not a typical side effect. Along with smoky images of espionage and science fiction are usually images of the gas machine used to administer the sleep-inducing gases. Like the gas itself, the fictional apparatus is inspired by reality. 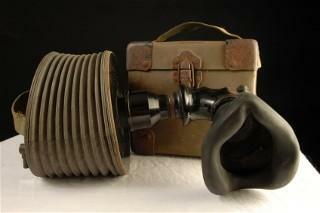 The history of nitrous oxide includes the Gas and Air machine invented by Dr Robert Minnitt in the early 1930s. The machine replaced other apparatuses that delivered high concentrations of nitrous; Minnitt's apparatus added air into the mix. Later developments mixed nitrous with oxygen. There may be few stories that continue the trend of delivering tales of gases that lull people into deep sleep. A strong parallel is apparent in the waning use of anesthetics like nitrous oxide. Current information and uses of volatile anesthetics is available on the Virtual Anaesthesia Textbook and the World Federation of Societies of Anaesthesiologists.